[Q5] How does the US, working with its partners, best contest DPRK operations? 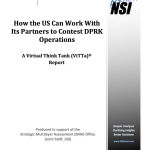 This report summarizes the input of 15 insightful responses from the Korea Strategic Outcomes Virtual Think Tank (ViTTa) expert contributors. While this summary response presents an overview of the key expert contributor insights, the summary alone cannot fully convey the fine detail of the contributor inputs provided, each of which is worth reading in its entirety. 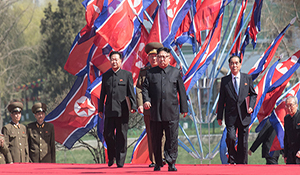 For this report, the expert contributors consider how the US can work with its partners to contest DPRK operations. This summary details the various approaches that emerge. Strengthening US-ROK-Japan military and defense cooperation and commitment. Cooperating with the DPRK rather than contesting it. Conducting an information campaign to empower the people of the DPRK and possibly bring about change in the decision making calculus of DPRK leadership. Putting pressure on China elsewhere in Asia. Addressing the wider problem of nuclear weapons proliferation in Asia. The most frequently cited way in which the US and its partners can effectively contest DPRK operations is with multilateral engagement.2 Contributors that advocate this approach highlight the advantages of strong multilateral alliances and partnerships for advancing US interests vis-à-vis the DPRK. Ariel F.W. Petrovics of the University of California, Davis offers a broad reflection of this approach, assessing that a multilateral regional engagement strategy, particularly one that “integrates persistent cooperative efforts with direct negotiations,” best positions the US to contest and overcome DPRK operations that run counter to US interests, and may “offer tangible benefits that simultaneously provide pathways for developing future leverage over Pyongyang.” Petrovics notes that the DPRK has historically been more receptive to sustained engagements that necessitate repeated cooperative interaction, while attempts at coercion have primarily generated hostility.3 There is also a clear lack of trust between the key regional actors with interests on the Korean Peninsula. Taken together, these factors suggest that a multilateral approach to engagement is likely to be more successful than a bilateral engagement approach when dealing with the DPRK. Petrovics explains that, “when trust between the necessary players is very low—as is the case with North Korean negotiations—engagement has the best chances of success when executed through a multilateral framework.” The prevailing absence of trust may also mean that multilateral engagement is most likely to be successful if participants can agree to delegate negotiating oversight and enforcement powers to an agreeable third party. The second most frequently cited way in which the US and its partners can effectively contest DPRK operations is by strengthening US-ROK-Japan trilateral military and defense cooperation and commitment.10 Yun Sun of the Stimson Center and Dr. William Tow of Australian National University both highlight the importance of enduring US military and defense commitment, stressing that the US “needs to remain steadfast in its efforts to coordinate its regional defense and security policies with its South Korean and Japanese allies”11 and “provide unswerving, consistent commitment to the defense of [both countries].”12 Not doing so, Tow contends, could increase the likelihood of regional instability. Contributors specifically underscore the critical role that the US plays with respect to deterrence and stability on the Korean Peninsula and in the region more broadly. The US maintains significant levels of troops in both the ROK and Japan,13 and its commitment to the defense of both countries is central to ensuring stability in the region. US deterrence capability is also central to contesting DPRK operations.14 However, while US-ROK-Japan military and defense cooperation and commitment has continued to deepen,15 McEachern contends that “much work remains to be done.” Dr. Sheila Smith of the Council on Foreign Relations echoes McEachern’s sentiment, highlighting several vulnerabilities that currently challenge the US-ROK-Japan alliance. These vulnerabilities include the missile threat to Japan,16 the lack of trust between the ROK and Japan,17 the need for the US and Japanese militaries to address how they will fight together, and the need for a broader understanding between the US and Japan on how to operationalize Article Five protections in the US-Japan Treaty of Mutual Cooperation. Integrating missile defense strategies and capabilities. Pursuing new forms of anti-submarine warfare. Working with allies to form constant maritime patrols to eliminate illicit trade with the DPRK. Enhancing surveillance and monitoring mechanisms along the China-DPRK border to prevent trade. Developing and implementing tools, procedures, and weapons to find, fix, and finish the DPRK’s missile and nuclear programs, including its mobile missile systems and command and control infrastructure. Planning for and practicing rapid surgical strikes against DPRK nuclear systems and long-range missile systems. Maintaining maximum sanction pressure on the DPRK until it takes meaningful steps toward denuclearization. Addressing the wider problem of nuclear weapons spread in Asia.